Blackcomb accommodations are a great option when you need more space and want to stay in a quieter part of Whistler. They and are most affordable when you book direct from Owners. See the Blackcomb accommodation options listed below that range from hotel-style suites with kitchens to full-sized townhomes. Booking directly with the Owner is super simple. Make an instantly confirmed reservation with a secure credit card payment made on this website. Every vacation rental listing was created by the property Owner and displays specific details and photos of the actual place that you will stay in. SKI IN SKI OUT trailside condo !, Beautiful mountain views, convenient to everything Whistler 3 HOT TUBS, LARGE POOL and exercise room, PRISTENE full bath/shower, PRIVATE DECK with WEBER GAS GRILL. Ski in ski out on Blackcomb; close to Blackcomb Guest Services, Whistler Kids & rentals. Front desk; 3 hot tubs; heated outdoor pool; exercise room; ski valet stores skis. This unit has a full kitchen; free Wi-Fi; AC; 2 TVs. Woodrun is a true ski-in ski-out facility located on Blackcomb mountain. Canadian Pricing, check xe.com for exchange rate, this is a deal!! Welcome to the McDaniel Ski condo. Enjoy true ski in/out access to the best mountain in the world. TVs in every room. Our condo sleeps 5. TRUE SKI IN SKI OUT PENTHOUSE. Luxurious, spacious, fully renovated condo. Heated floors. Gas fire. Air conditioning. Stunning mountain views from every room. Free parking. Free WiFi. Netflix. Large shared hot tub and pool. Close to Blackcomb Base. True ski in/ski out, beautifully renovated condo in popular Woodrun. Swimming pool, hot tub and moments to the village. Ski in/out. Penthouse Suite. 3beds, 2baths. Canadian Pricing, check xe.com for exchange rate, this is a deal!! Prime Ski In/Ski Out location on Blackcomb. Located in the Greystone Lodge. One of the largest and nicest condos in the building. TRUE SKI-IN/SKI-OUT near WIZARD chair, RENOVATED Summer 2017 Family friendly secure building with quiet hours, 2 BD + loft, 2 storey living room Fully equipped kitchen, parking included, heated outdoor pool. 2 Hot tubs. Fantastic One bedroom ski in/ski out. Located close to everything Whistler has to offer! SKI-IN/SKI-OUT, Newly Renovated and AIR CONDITIONED 1 Bedroom with King Size Bed plus Queen Sofa Bed, Located in the Upper Village. Sleeps 4. Walk to Everything. Heated Pool & Hot Tub. Two 32" Flat Screen HDTV's, Computer and Free Wifi. Fabulous ski in/ski out property with heated year round pool, hot tub, exercise room, Air conditioning, and High speed Internet. Fabulous 1 bedroom condo on Blackcomb Mountain. Fantastic views from the condo, pool, hot tub, free wireless internet, A must see! Bright one bedroom unit with private patio, new appliances and great facilities. Beautiful ski in/ski out condo. You'll love it here! Look for our long stay specials! Deluxe ski in ski out townhouse unit on the Blackcomb Benchlands uphill from the Chateau Fairmont. No additional taxes or service fees. Free High Speed Wi-Fi. Private hot tub.Wood burning fireplce with free wood. Our well appointed 1 bedroom + loft offers a spacious layout for friends and family to relax during your visit to Whistler. The unit has 2 bathrooms (2nd bath renovated Oct 2016. Close to the slopes, communal hot tub. Ski in/ski out - NEWLY RENOVATED- located just above the village. Convenient to Lost Lake x country trails. Complimentary Parking and internet! Lovely 2 bedroom condo in Wildwood Lodge. Enjoy the fabulous outdoor deck. Very unique to this unit. Curl up by the fireplace after a long day of skiing and have a holiday to remember! One bedroom, One bathroom condo located on the Benchlands, 2 minute walk to the lifts. Hot tub, Wireless internet, Perfect! Lovely 2 bedroom 2 bathroom unit in the very popular Wildwood Lodge. Lovely views, free parking and internet are some of the many features! Quiet location - great for families. Wonderful 3 bedroom, 2.5 bathroom townhouse in quiet location. Renovated and very spacious. Shared hot tub. Heated slate floors. Private garage. Free shuttle to lifts. Wireless internet. Washer and dryer. Blackcomb Townhouse with huge outdoor common hot tub, 2 level, bright and spacious, hardwood floors, 3 way fireplace, steam shower,free internet, flat screen TV+DVD players, 2 priv. parking spots, gourmet kitchen, heated floors. 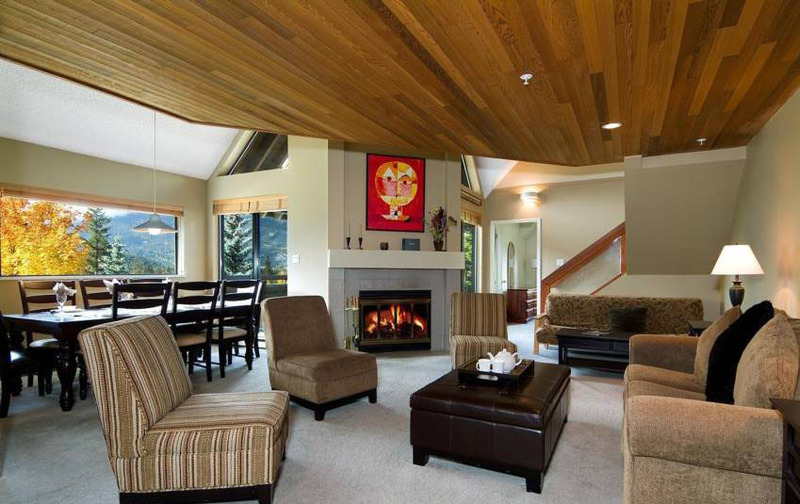 Tastefully decorated townhouse, 350 metres from Blackcomb base. Private garage for gear storage. 2 bed / 2 bath Townhome located in the Gleneagles complex, on the first hole of Chateau Whistler Golf Course Convenient location for all your needs while in Whistler. Spacious 3 bedroom, 2 bath townhouse with fully equipped kitchen and free wifi on Blackcomb Benchlands.. Free reserved parking stall in underground garage. Free shuttle bus nearby. Beautiful 2 bedroom, 2 bathroom condo located right next to the Chateau Whistler Golf course. Minutes to the Blackcomb base and Whistler Village.Wifi, free parking, laundry are but a few of the features of this unit. Superb ski in location, free shuttle bus (5 minutes to gondolas, shops and restaurants), walk to Nordic ski and snowshoe trails, Lost Lake and the Chateau golf course. View these Blackcomb accommodations on the Blackcomb Map. See more Blackcomb accomodations available in the Blackcomb Base area. Search over 500 Whistler accommodation rentals direct from owners and take advantage of discount Whistler lift tickets and equipment rentals with your reservation. Learn more about all of the Whistler accommodation areas to choose the place that's right for you. List your Blackcomb accommodation rental on this annual subscription-based Whistler accommodation directory. Join a community of 550+ like-minded Whistler homeowners who are helping Guests to the resort have the vacation of a lifetime! In just minutes a day, you can take control of your Whistler rental home and eliminate management fees, from anywhere in the world. Automated booking tools enable you to take instant online reservations by credit card. Your calendar is automatically updated and email confirmations are sent to both you and your Guests within minutes of a reservation happening! Subscriptions also include a private, unbranded website that uses the same booking tools. This means you can process all bookings from any other websites or media you advertise with through one central system without the risk of double-booking. 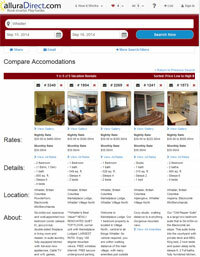 View Whistler listing service details or contact us for more info.